Our Staff at Serenity Now is dedicated to helping clients discover and utilize their inner strengths. Our philosophy respects the integrity of each individual and his or her ability to grow. 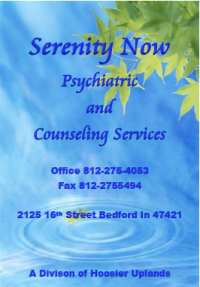 We provide individual, couples, family and marriage counseling in a warm and welcoming environment that is safe and comfortable for both adults and children. Serenity Now accepts most insurance policies and is fully accessible.